An undated memorandum listing recipients of oranges sent from Belair Grove in Sanford, Florida. Recipients included the President Chester A. Arthur (1829-1886), ; William B. Allison (1829-1908), Republican Senator from Iowa; Senator Henry B. Anthony, Republican Senator from Rhode Island; Eugene Hale (1836-1918), Republican Senator from Maine; abolitionist Amos Adams Lawrence (1814-1886); U.S. Court of Claims Judge Bancroft Davis (1822-1907), who also was the president of the Newburgh and New York Railway Company; former Republican Governor of Connecticut Marshall Jewell (1825-1883); and Union General William Tecumseh Sherman (1820-1891). 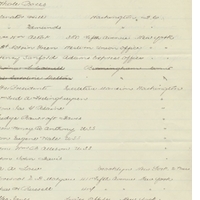 Original memorandum by James Edmundson Ingraham: box 52, folder 5, subfolder 52.5.3, Henry Shelton Sanford Papers, General Henry S. Sanford Memorial Library, Sanford Museum, Sanford, Florida. Digital reproduction of original memorandum by James Edmundson Ingraham. Ingraham, James Edmundson. “List of Recipients of Oranges from Belair Grove.” RICHES of Central Florida accessed April 18, 2019, https://richesmi.cah.ucf.edu/omeka/items/show/4389.